Tony Blizzard, 82, recalls three patriots, all born in the 1880’s. 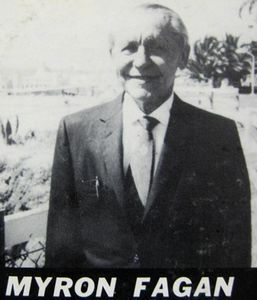 The first is Myron Fagan, an anti-Communist Jew who was the first to expose the Council on Foreign Relations. Supplying much of the information for Henry Ford’s “The International Jew,” Paquita had many Jewish supporters who knew the Protocols were authentic. Finally, Tony recalls the courageous Illuminati defector Edith Starr Miller who wrote the classic exposure of the satanist NWO, “Occult Theocrasy” with Paquita. I learned early on that all Jews do not live by the talmud. In fact, those Jews who fight the evil are the most tireless and dedicated of all. They know the absolute satanic evil of the agenda and what it does to the world.